In this flourishing and burgeoning area, there are plentiful and diverse opportunities to purchase Charlottesville land. 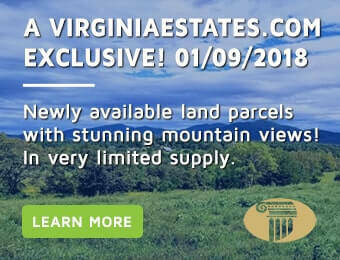 Virginia Estates will be able to help you navigate the process of fully elaborating your Charlottesville land and real estate needs, understanding the requirements and incentives to buy and build on Charlottesville land, and searching for the perfect parcel. Whether your interest in Charlottesville land is for a business venture or a private home, we will be able to help you identify some of the best Charlottesville land available and negotiate an ideal price and contract. What is this land for and what location will best serve that purpose? Ideal Charlottesville land for a new business is going to be quite different than ideal Charlottesville land for house in the country. Fully understanding your vision for your Charlottesville land allows us to find a selection of the best possible Charlottesville land listings. Can you build on it? If not, the buyer will be responsible for bringing utilities and sometimes roads to the Charlottesville land. However, the price will reflect that and we can help you assess given your budget which Charlottesville land offerings are the best deal. It is imperative if you are interested in buying Charlottesville land that you work with a real estate professional that has a comprehensive understanding of the local applicable zoning ordinances. What type of permits will Charlottesville & /or the county require? Likewise, real estate professionals that have extensive experience will have a deep understanding of Charlottesville land permit issues as well as the zoning laws. Are there any liens or easements? These can greatly effect the value of your Charlottesville real estate, so its crucial that you learn about them prior to making an offer. Where exactly are the boundaries? When buying Charlottesville land, especially if you are buying a large parcel, it is important that you know exactly what your buying, either through doublechecking the survey by walking the land or getting an updated one. What is the cost to develop and build on this Charlottesville land? Being able to get a good faith estimate of this value will aid you greatly in assessing the pros and cons of different suitable parcels. Who would I like to build on my property? You can buy Charlottesville land with a great deal more confidence if you already have figured out who will be building on the land and negotiated a contract which covers how much it will be and how long it will take. Additionally, Virginia Estates, having facilitated an extensive amount of land sales over the years, has excellent knowledge of the building process and superior relationships with local builders. We are able to use these relationships on behalf of their clients to get you the best quality and price possible for building on your Charlottesville land purchase. If you are thinking about buying Charlottesville land, please call or email us and we’d be happy to answer your questions and further share why we might be a good partner in helping you to find the Charlottesville land you want.